Long Road welcomes all students. Teaching and support staff have a strong commitment to making this a college where students have equal opportunities to succeed. All students are encouraged and supported to develop their skills and independence. Students with a range of physical impairments, learning difficulties and health issues study here and achieve the same high standards as all other students at the college. Their experiences and advice have helped us to make Long Road accessible and friendly to those with special requirements. We listen and respond to individual needs to ensure that everyone has the opportunity to take full part in the academic and social life of the college. All buildings have ready access for wheelchair users. We have a team of qualified specialist support tutors and can provide formal and informal assessments of students’ individual learning needs. We provide classroom and general assistance for students who have physical impairments such as partial sight, partial hearing and motor skills difficulties. Individual teaching support is available for students with specific learning difficulties such as dyslexia or Aspergers. Support can include help with areas such as study skills, time management, essay writing and exam techniques. Students with English as their second language can receive individual support. A range of specialist IT equipment and software is available to support students’ studies including text-to-speech and mind-mapping programmes. All courses provide opportunities for individual support in workshop sessions with subject specialists. Throughout the year there are workshops on revision, self-confidence, time-management. All our students benefit from a strong guidance system. They will have a personal Progress Coach to provide support and guidance throughout their time at the college. Please call for a copy of our Disability Statement (available in braille and large print). The government has introduced new laws for children and young people with special educational needs and disabilities (SEND). 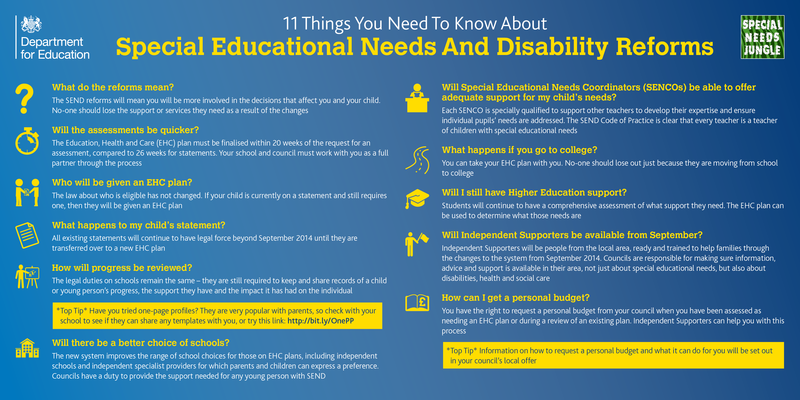 From 1st September 2014 local authorities replaced statements of Special Educational Need (SEN) with a new Educational and Health Care Plan (EHCP) as well as publicising a Local Offer of the services and activities that are available to parents and young people. In addition young people with a Learning Difficulty Assessment (LDA) will be able to request from the local authority an EHC assessment. To support this change the government are funding an Independent Support Service to assist young people. Please click to download information on Independent Support.